Hi guys, welcome back! 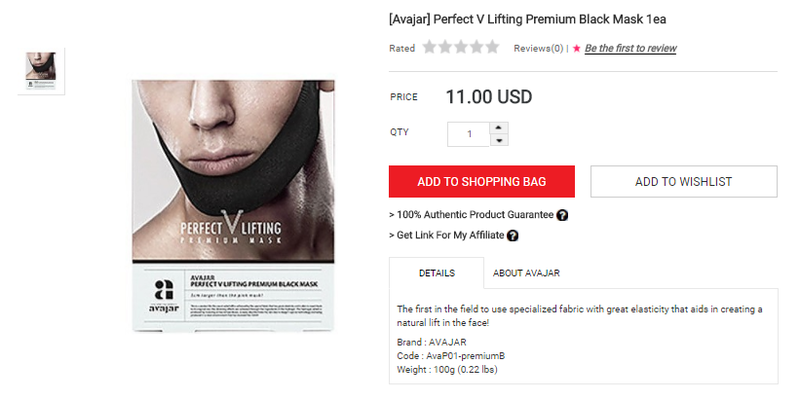 Today I'll be sharing about Avajar's Perfect V Lifting Premium Black Mask! I have never seen this product other than Stylekorean, and that's saying something! I stalk quite a lot of K-beauty websites and I've only ever seen the brand on SK. They sell V-lifting sheet masks, and at first only the pink one was available. 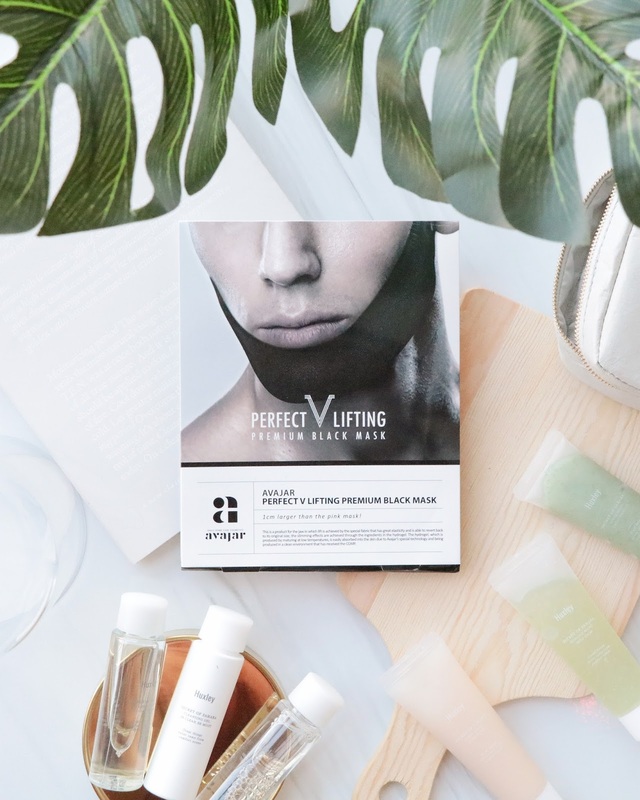 I was curious as to how it works (because I've never tried a V-lifting mask before) and came across Stella Angelina's video on Youtube! The mask helped to slightly lift her double chin, and I was even more intrigued! A few weeks after watching her video it was announced that Suju would be Avajar's new spokesmodel, so I decided to pick one up to try out for myself! As this mask was made to be used by guys, this mask was made 1cm larger than the original pink one (but is made with the same fabric & hydrogel material). 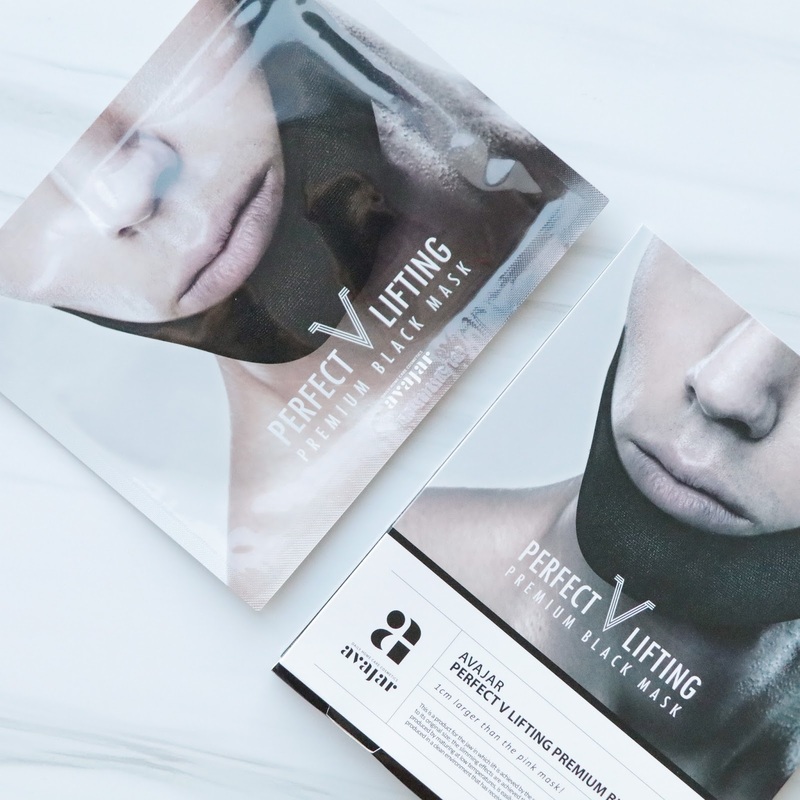 Unlike other V-line masks, this mask promises to retain its shape even after you use it. This means that it will constantly pull your face upwards. This kinda makes sense, because if your mask stretches and doesn't retain its shape, it will be as if you just put on a normal sheet mask and there will be no/less pressure. Suju made it look so fabulous, but realistically speaking, I do not think this product was meant to give you a V-line, but more of to reduce/de-swell the fat area around your jaw & chin. Not everyone has a V-shape, and I think "fat reduction/deswelling" mask would be more appropriate haha. 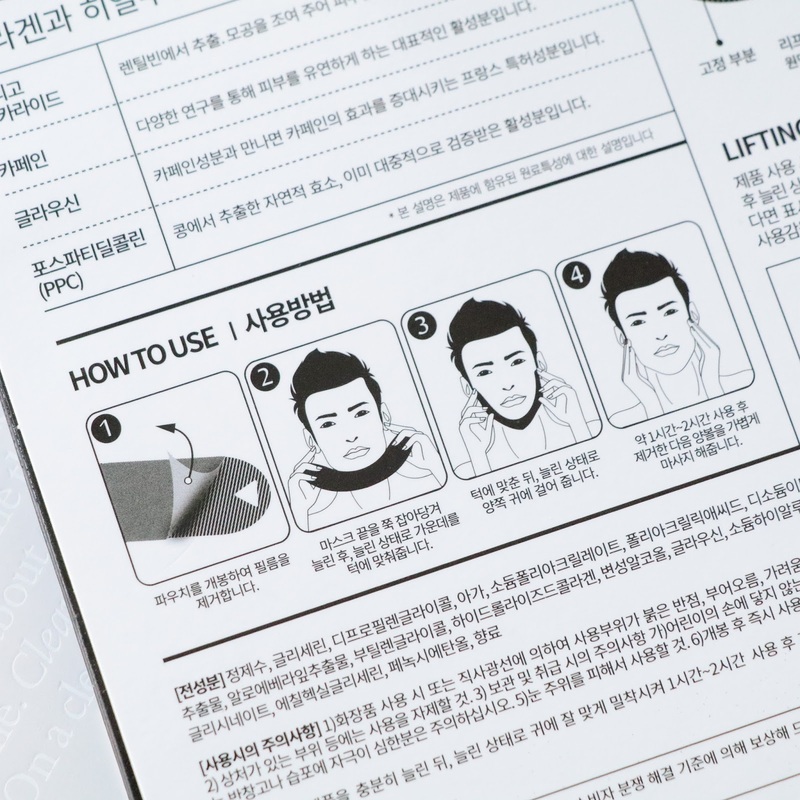 I got this product from Stylekorean, and its available per sheet for $11. The retail price of this mask in Korea is KRW9800 ($9), so I guess its only slightly more expensive. Is it worth the price? Keep reading on! To be honest I quite like the packaging. 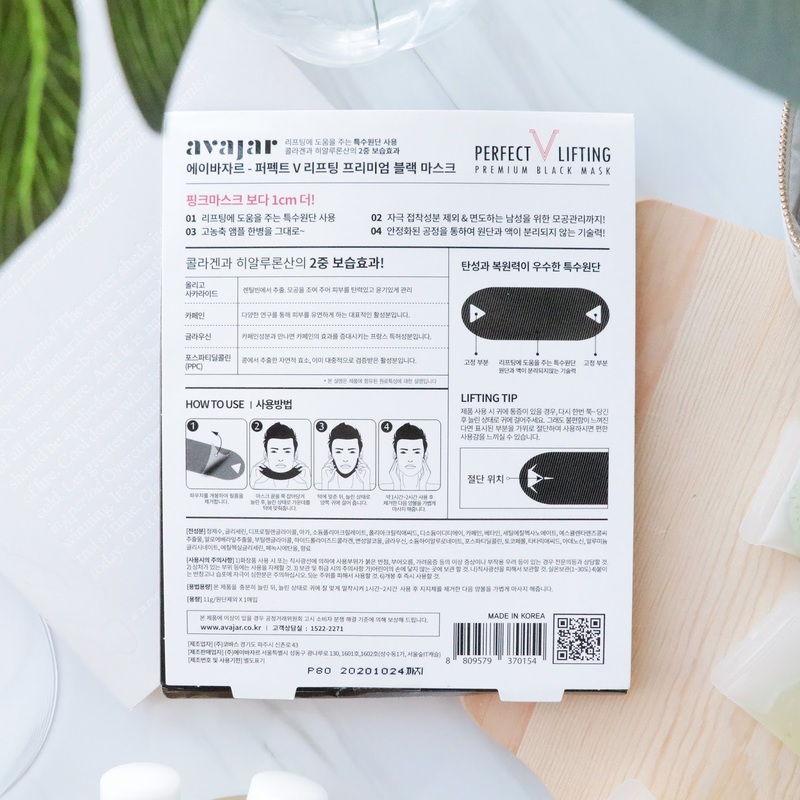 It comes with a cardboard sheet with descriptions, and inside the cardboard sheet is the usual plastic mask container that holds the mask itself. To my surprise, the mask wasn't dripping wet when I opened it! I thought it would be soaking wet like how normal sheet masks are, but it wasn't. 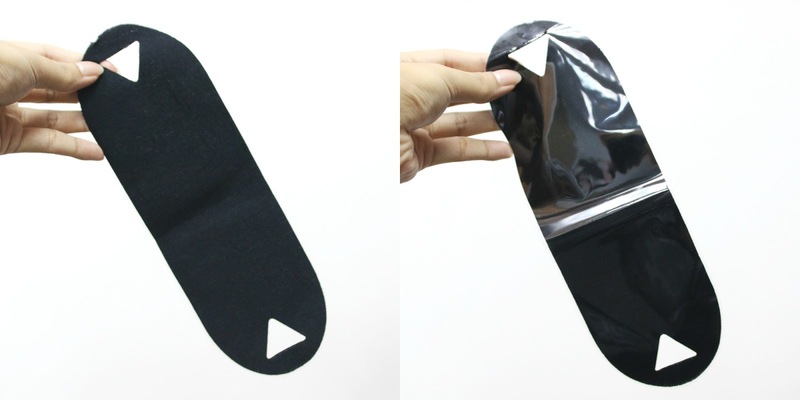 The gel part of the mask has a plastic guard, and you can easily peel it off when you want to wear it. hyaluronic acid which is great at retaining moisture. They said that there's a full bottle of essence in the hydrogel, but I kinda find that hard to believe because the mask was not wet or anything haha. It does not have mineral oils, parabens, silicone, benzophenone, sulfates, triethanolamine & artificial colorings. It does not smell strong at all and when you put it on, you can only faintly smell a nice, clean scent. 3. After matching your chin to the middle of the mask, hook onto the ears and leave for 1-2 hours. The mask was a perfect fit on my face shape and felt cooling when I first put it on. I guess my cheeks are just fat because I could immediately see that my cheeks were bulging hahaha. I wore it at work, and it was...an experience. I'm not sure why, but as time progressed it became tighter and tighter. At the 30 minute mark I kinda felt it it tightening around my ears, but at the 1 hour mark, it was already on the point of irritating! It wasn't super painful, but the pressure around my ears got to a point where it was getting hard to focus on my work. I think this would be great to use when you go to sleep or when you're watching a movie (aka when you don't need to focus heavily on something). As for the effects, I feel like it didn't give me a super defined jaw but it did manage to slightly de-puff my cheeks. I'm lucky enough to be blessed with a slightly sharp jawline, but it's currently hiding behind my chubby cheeks. This mask didn't fully define it, and when I looked at myself in the mirror it didn't really look any different. However, when I checked the images that I took, I found that there was indeed a slight difference. I wouldn't call it dramatic, but for $11, I think it's looks alright! I wouldn't depend on this as a sure was to lose weight. If you have a big night where you know you'll be taking pictures, I think this would be a nice pick me up to slightly boost you're appearance. To be honest, I don't think I'll get another one of these masks, but I think they're useful if you want a quick (temporarily & subtle) pick me up. And that's it for this post! I hope you guys enjoyed reading about this product. 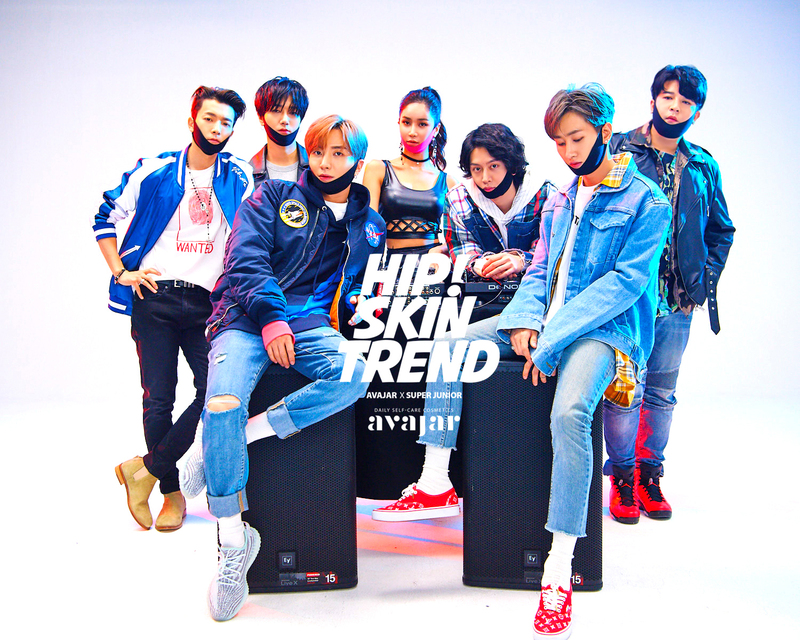 I'm currently on Stylekorean looking for more fun products to try out. If you guys have anything you'd like me to try, tell me in the comments or message me on my SNS and I'll try to get them for you guys! Yes, I noticed the difference. Maybe it'll work if you use it several times. But i think its just temporary so i'll still go on vlifting exercises. haha. BTw, i love your blog, it's very organized, informative,not boring and I love that you put on some pictures. Looking forward for more!! Happy Love Month, Eros! This is interesting! 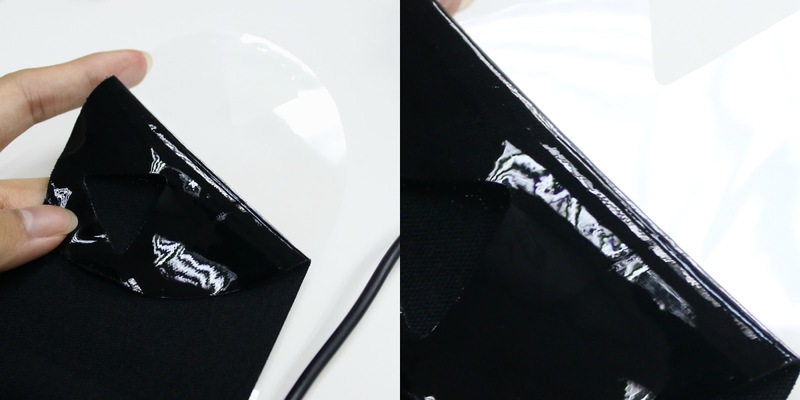 Definitely can see the difference after first usage ^^ very neat, beautiful and informative post as always ^^ Happy VDAY !! Is this resuseable or for one use only? Hi, thanks for dropping by! For more mature skin, I'd recommend heavier, more cream based products. I'm doing an anti-aging post soon but since I am quite young, some of the products may not work for you. However, I have bought some skincare products for my mum that she has enjoyed, so you might want to check them out as well!